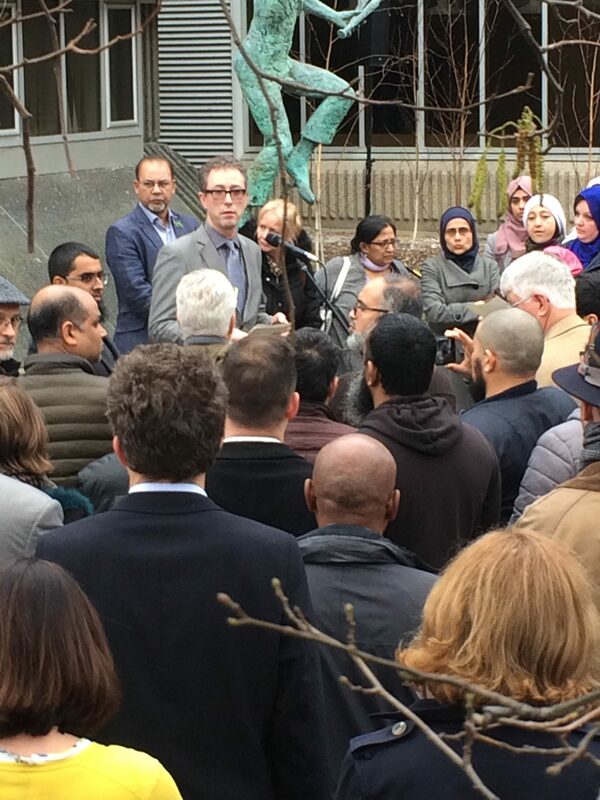 Hundreds of people attended a vigil in Hove this afternoon (Thursday 21 March) for the victims of the mosque shootings in Christchurch, New Zealand. They held a minute’s silence in memory of the 50 people who were killed last Friday (15 March). Fifty more were injured when an Australian man, Brenton Tarrant, 28, went on a rampage at two mosques. 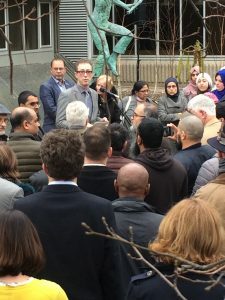 Muslim, Jewish and Christian faith leaders, Brighton and Hove City Council chief executive Geoff Raw and council leader Daniel Yates addressed the crowd at the vigil outside Hove Town Hall. Some of them also mentioned the attacks on five mosques in Birmingham overnight, with Mr Raw asking everyone to be vigilant. Councillor Yates said: “Although only a few of us are speaking, by being here all of us are sending a message. Asmat Roe, who chairs the Brighton and Hove Muslim Women’s Group, was greeted with applause after her humble and heartfelt speech. She said: “It is really heart-warming to see so many people from such diverse backgrounds here today. “The outpouring of love, care, concern and support that has come out of this tragedy gives us hope – and hope is the message we need to take away from today and from these tragic events. “Political parties, leaders, the media and internet industry need to pro-actively work to stop islamophobia, anti-semitism and all forms of racism to counter the far-right threat in the real world and on social media. “Only 20 per cent of our communication is verbal. Yet spoken words are an extremely powerful tool and need to be used with care, knowledge and wisdom. “Public figures, particularly politicians, must stop the dog whistle politics which targets the most vulnerable in our society. “This gives the oxygen of publicity to extremists and makes everyday life for many individuals from minority communities unsafe. “Let’s work to create a city where asylum-seekers, refugees, Muslim women in scarves, black or minority youths, LGBT and disabled people – all of us – feel safe every day in our daily lives. “Let us ensure that we have safe spaces where young people and women from minority communities can share their experiences, gain support from each other and confidence not just to live but thrive. “Like many of our role models, I still have that dream – and I hold on to the message of hope, of love, and I ask you to do the same. Other speakers included Tariq Jung, who chairs the Brighton and Hove Muslim Forum, Mahir Chowdury, who chairs the Racial Harassment Forum, Fiona Sharpe, from the Sussex Jewish Representative Council, Rabbi Andrea Zanardo, from the Brighton and Hove Reform Synagogue, Imam Uthman Jeewa, from the Al-Medinah Mosque, Father Jerome, the acting chair of the Brighton and Hove Faith Alliance, and Richard Williams, who chairs Sanctuary on Sea.